The the Swift, the Polo and the i20 are world cars - meaning they cater to a global audience and aren't restricted to any specific markets. And, these too are made in India. With them they bring quality and equipment of a global standard and that instantly makes them premium offerings. Yes, there are the hatchbacks from the German and Swedish luxury brands, but that's a different niche altogether. For the masses wanting to spend their hard-earned buck on a compact car, these premium hatchbacks are the farthest limit to which one could stretch. The i20 has pushed this envelop to a whole new level with its new iteration. 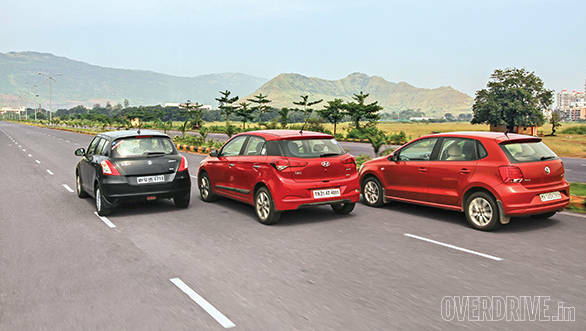 So we have put it up against the segment leader, the Swift, and the German hatch, the Polo, to see where the premium hatchback tussle is headed. The Swift gave birth to the premium hatchback segment in India and the vehicle worked so well that Maruti Suzuki decided to continue its established design theme on the current Swift too. Add to it the sheer volumes that the Swift has generated and you will realise how common the Swift's shape has become on Indian roads. On the flipside, you may not realise that the current Swift is hardly four years old. It still manages to look stylish but doesn't stand out anymore. There is a facelift coming in a few weeks, but it is so subtle that it won't affect the Swift's road presence in any way. The Polo already received its mid-life makeover a few months back but it seems like a half-hearted job. Some minor tweaks to the lamps and bumpers along with a new shade of paint make up the changes. It would have been nice to see further revision to the design. 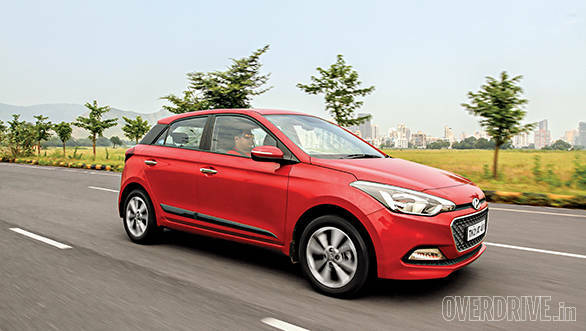 The Elite i20, unlike the Swift or the Polo, benefits from being an all-new car. Due to its mistimed launch, the earlier i20 never really incorporated a full-fledged fluidic design philosophy, but was successful of its own accord thanks to trims brimming with features. The new one though, makes extensive use of the new Fluidic 2.0 design theme. The face has sharp features, while the profile isn't too busy with unnecessary cuts and creases. The car also has a strong Santa Fe inspiration to it. The tail lights look like a swordfish's tail wrapped around the boot lid and have a fish scale pattern too. Depending on the colour you choose, the tailgate of the i20 may look overdone. Ours looks sporty in red, but for some reason I find my neighbour's looks busy in blue. 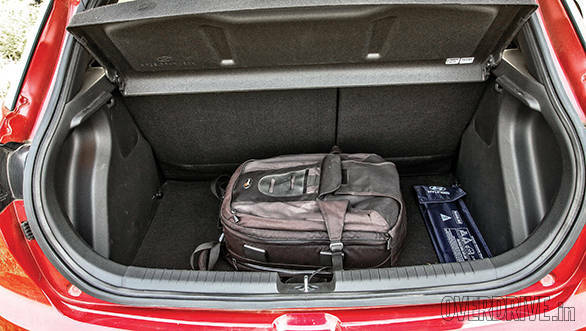 The i20 looks tall, wide and big enough to warrant an upper hand over the feature-packed Grand i10. As compared to the Swift and the Polo, it expectedly looks more new-age. On the inside, the difference isn't as glaring though. 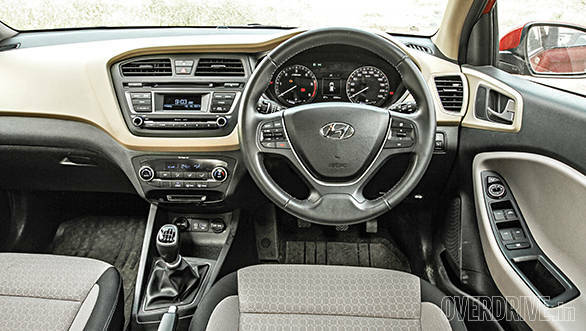 The i20's interiors come across as an evolution of the Grand i10's layered design theme. It has the typical Hyundai colour scheme of brown and black. Unlike the last i20's uniform blue backlight for the all the lit elements on the dash, the new one makes use of blue illumination for the infotainment and white for the instrumentation. This instrumentation too employs a multi-info display between the clocks, but unlike the Polo and Swift which employ a numerical LCD panel, the i20's unit displays graphics as well. I particularly like the steering position alert on this screen, which warns you on vehicle start-up if the wheels are not pointing straight. But while features like this, the rear air-con vents, automatic headlights and reversing camera with active path guidance can make most mid-size sedans look under-speced, the i20 loses out on some basics like speed-sensitive door locks and a fuel range calculator. The Swift and the Polo clearly feel old when it comes to creature comforts. Both get automatic climate control and that is pretty much it. The Swift doesn't even get reversing sensors or a Bluetooth capable audio unit. But its audio quality is better than the other two. The i20's audio unit trumps the Polo and Swift though since it also comes with 1GB of in built storage to store audio files. In terms of fit and finish and quality of plastics, there is nothing to separate these cars. All three feel top notch and have no disproportionate panel gaps or rough edges to complain about and the controls in all the three cars fall easily to hand. 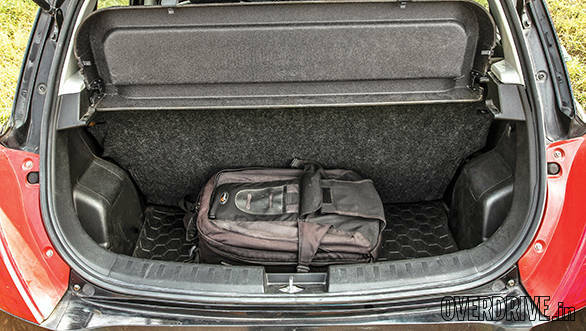 If features and creature comforts aren't what you care about (though you should), then the design of the cabin is the only thing that will make you switch choices here. 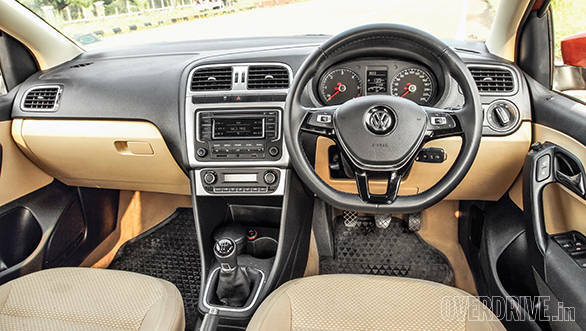 While the i20's cabin feels wide-spread like that of a sedan, the Polo's cabin is serious with a no-nonsense, easy to read design with a hint of sportiness to it, thanks to the flat-bottom steering wheel. The Swift's all-black theme looks sporty and the cascading waterfall design still looks quite smart. 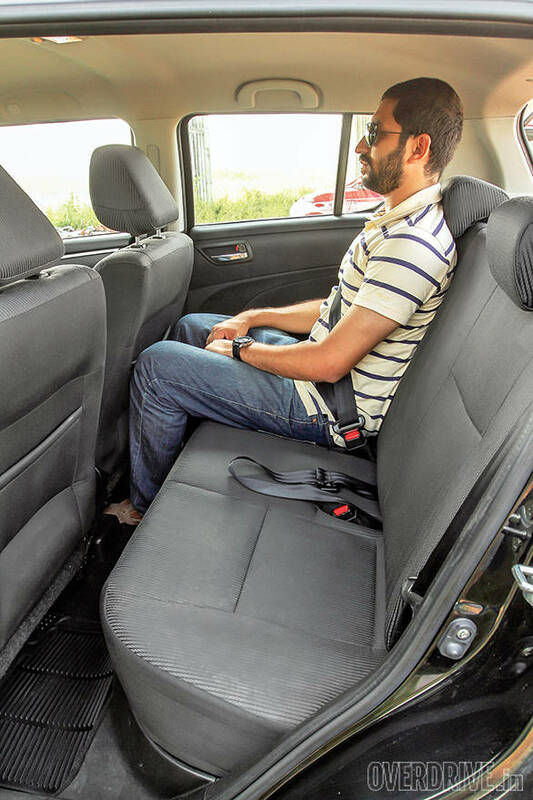 However, the all-black interior also means the cabin feels smaller than it is. Both, the Polo and the i20, with their lighter colours create a perception of space, but only the i20 is as spacious as it looks. 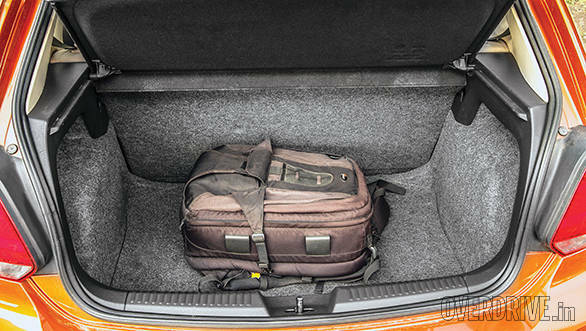 It has the most useable leg, knee and shoulder room out of the three and rear seating is comfortable even for grown ups - an area that the Swift and the Polo have been criticised for since launch. But the Polo is a driver's car and that's the seat in which you want to spend most of your time. It has the new 1.5-litre engine, which even without the GT TDI state of tune, manages to make the car feel like enjoyably quick. It has a sharp throttle response, on tap torque and is complimented by a precise steering setup. 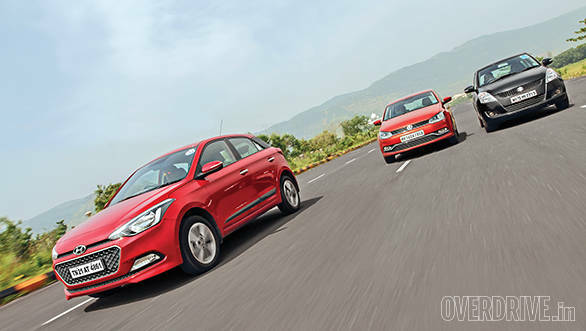 The i20's 1.4-litre diesel from the new U2 CRDi family is a potent engine too but lacks the sporty and rev-happy character of its older siblings. It is slightly jerky on the low-end and over 2,000rpm is when the power delivery starts becoming more linear. Past the 3,500rpm mark though, the engine gets noisy with a gravely note. 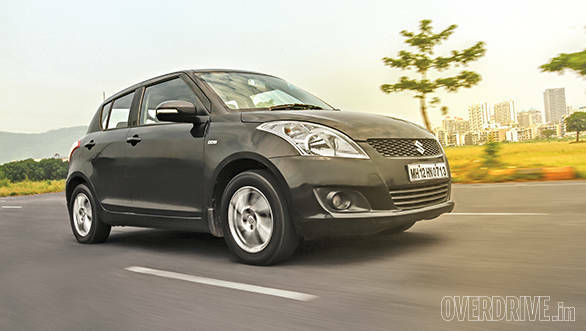 The Swift's engine feels the most refined of the lot and has a good midrange. But it is noisy too and you can feel the sudden surge of the turbo boost beyond 2,200rpm and that can be exciting or unnerving depending on what kind of a driver you are. Suzuki always does a better job than Fiat when it comes to gearbox tuning and it still remains one of the smoothest and most easy to use gearboxes around. The i20's unit is on par, but its throws are longer. The Polo on the other hand has a smooth and weighted feel typical of a German box but it needs to be precisely slotted or can result in a mis-shift if you're rowing in a hurry. But when you push the Polo around bends, it comes into its zone and feels like a light and fun hatchback. Its turn-ins are pretty quick and there is comparatively lesser body roll. As we have noted earlier, the Polo is now the segment benchmark for ride quality and is a great handler too. The Swift also handles corners, potholes and undulations pretty well. There is a bit of body roll, but the car feels stable and planted - particularly on the ZDi trim with its wider rubber. The i20 nearly matches up to the Polo's ride quality on good roads but it doesn't quite match up when the roads get bumpy or broken as is often the case in Mumbai. It does however improve significantly in one department Hyundais tend to lag noticeably - cornering. The i20 is now much more capable and confident at it. In terms of safety features, the three cars are closely matched and I'm disappointed to say this. The older i20 offered up to six airbags, making it one of the best premium hatchbacks as far as passive safety was concerned. The new one, like the Polo and the Swift, only offers up to two airbags (driver and front passenger). The Polo has become more responsible though, with the driver airbag being standard even on the base models. All three cars get ABS too. The brakes feel a tad spongy but progressive on the Polo; on the i20 they feel sharp and abrupt and need getting used to, while the Swift's brakes feel a little wooden in comparison. 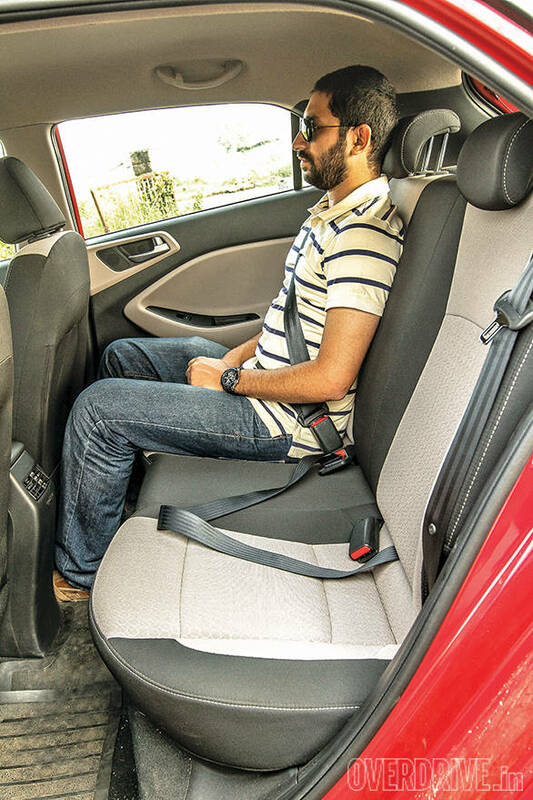 The new i20 has an improved steering set-up as well and is the lightest of the lot. Therefore it feels the best out of the three as far as driving in the city is concerned. 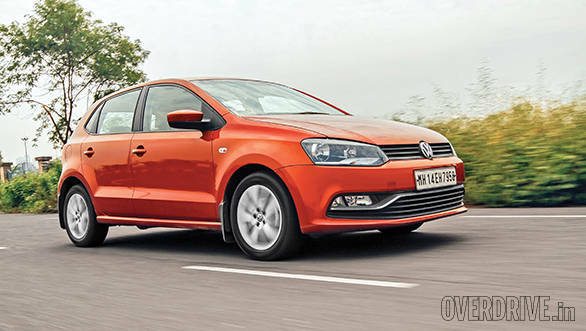 The Polo's steering is tuned to be heavier and will excite the driving enthusiasts the most. 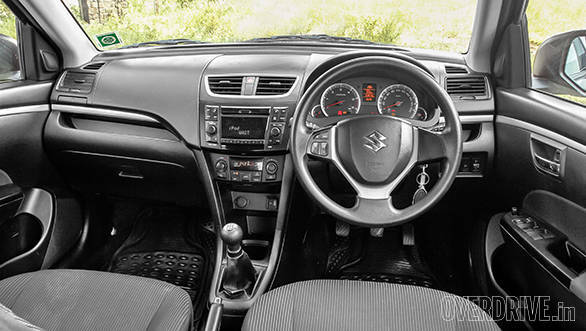 The Swift has a good balance and remains one of the best steering set-ups out there. In fact, the Swift does everything right and so it isn't hard to see why it's one of the favourites. But its aged rather quickly with the competition closing in on it with all that they can and so there clearly are better options out there now. The Hyundai offers tantalising design and the most features in this category, although not all of them are things you will regularly use and appreciate. And the dropped extra airbags over the old i20 don't help the cause. 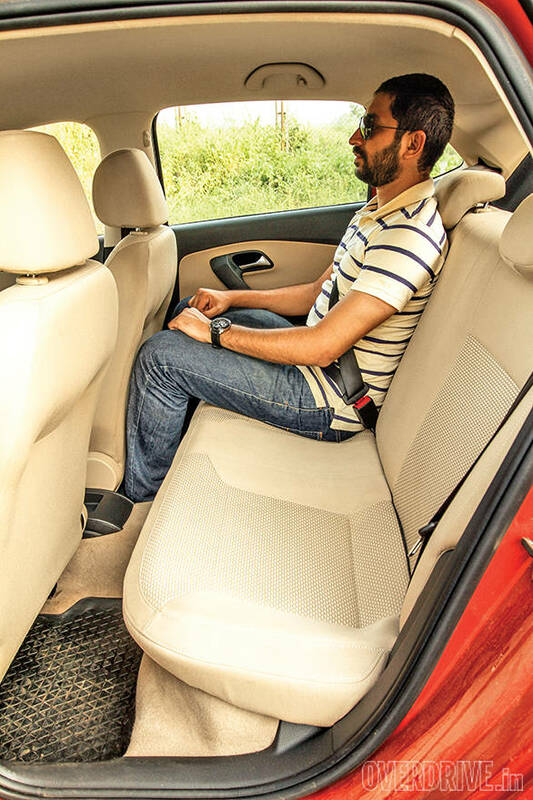 While it offers the most space here it also charges a huge premium for it, being Rs 1 lakh more than the Swift and over Rs 40,000 more than the Polo. And that's too much in our opinion. Which brings us to the Polo. The new Polo is finally the car it always should have been. It now offers the best ride, handling, performance and even manages to be the most efficient. It's not just a great driver's car but it has the typical solid build quality of European cars. The Polo then offers the most bang for your buck.